Cancer, one of the top killer that end our human life. 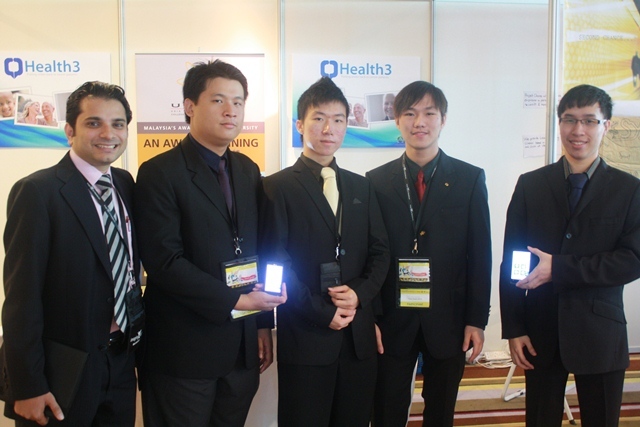 Four students from Asia Pacific University College of Technology and Innovation (UCTI), Malaysia designed Health3 to lead cancer patient to a healthier lifestyle and increase their survival chances. The team is consist of Tan Jit Ren, Chan Wai Lun, Wong Mun Choong and Ker Jia Chiun. With the help from Muhammad Anis Ur Rehman, mentor for this project, they have successfully enter the worldwide final of Imagine Cup. Check out their project at Imagine Cup People Choice’s Award and support them if you like their project by casting your vote on them. They will heading to New York City represent Malaysia in Imagine Cup 2011 Worldwide Final in Software Design category this coming 8th – 13th of July 2011. They will be competing with teams around the world. I’m lucky enough to get contact with them and learn about their story as one of the Microsoft Student Partner (MSP) Social Media Team. Health3 is an application designed to improve the health of a cancer patient focusing on three important factors, which are the well-being, medication and emotional support. Cancer patients can get state of the art technological approach towards food monitoring, medication intake monitoring, body vitality tracking, interactive physiotherapy exercises and awareness of nearby essential places to gain help and support. The ability to link up with cancer based NGOs, cancer experts and other patients create an integrated environment whereby it gives the patients emotional support as well as the feeling that they are not alone in fighting this cancer war. With cloud, cancer patients can also gain the benefits of Health3 via a lite version which can be deployed on mobile devices. The lite version also comes handy with an emergency help function that detects the location of cancer patients and alert related parties for immediate medical attention when activated. Health3 also comes with a quick report generation function that gathers data of past activities with Health3 to help doctor analyze cancer patients’ health status for better decision making. Focusing on the ability to customize, Health3 enables each distinct cancer patient to have the most sophisticated health monitoring application in addressing their needs individually. The whole idea of health application has been taken to a brand new level which changes the concept of how health applications are deployed on technological devices to fully maximize the benefits of health application with the aim to lead patients to a healthier lifestyle and increase their survival chances. We get inspiration from people around us, even relatives of us who died due to cancer. It was our second time. First time we did not do well during the local final in 2010 but managed to grab a side award which consists of “Best Implementation of Multipoint” then we continue to learn and managed to win 2011 Imagine Cup Malaysia Final. The journey is simply amazing as we meet a lot of people and learn from them. Exposure, experience and team work which prepares us to real life challenges and very good experience for us as a platform to be a business partner in the future. Further enhancement and development will take place and we will deploy our application to National Cancer Society Malaysia and other cancer based NGOs as they already show their interest in us. Find out the latest update from Team Cyber Knightz by liking the team on Facebook fans page.You can also stay tune in my blog for more update on Team Cyber Knightz and event of Imagine Cup 2011 Worldwide Final at New York City or follow the official Imagine Cup fans page or Twitter.